We are Christmas tree aficionados here at Magellan Towers – I personally can take or leave every other kind of Xmas decoration but since childhood, the decorated Christmas tree has held me in its thrall. So, for our penultimate post for 2014, here’s our five favourite Christmas trees seen recently on our travels. 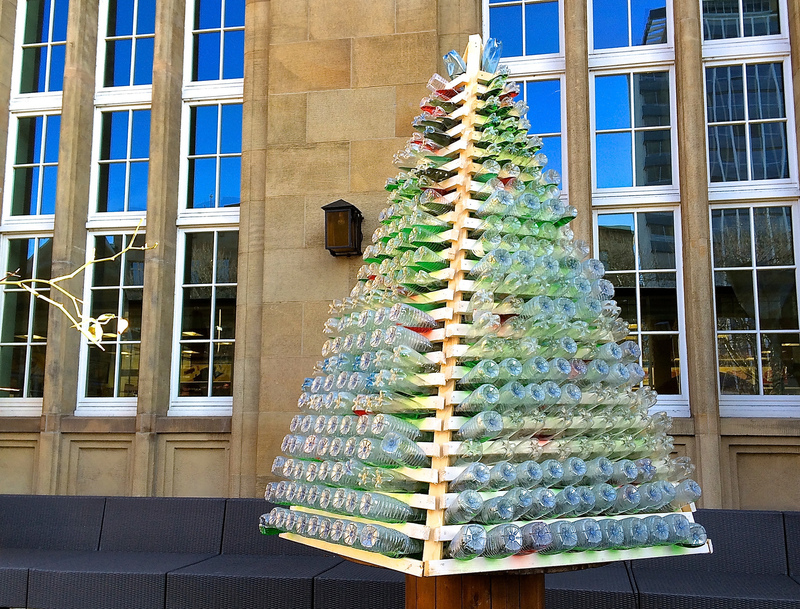 Let’s start off in Basel for this most unusual, recycled tree made from used water bottles filled with different coloured water – seen outside Les Garecons, Basel at the Badischer Bahnhof (German Railway Station). A little crazy, very green and for our money, the most innovative tree we have ever seen. Basel is also the home of Johann Wanner, AKA Mr Christmas – the king of Christmas Baubles – who is called upon by Buckingham Palace, The White House and even the Pope on occasion to style their trees. 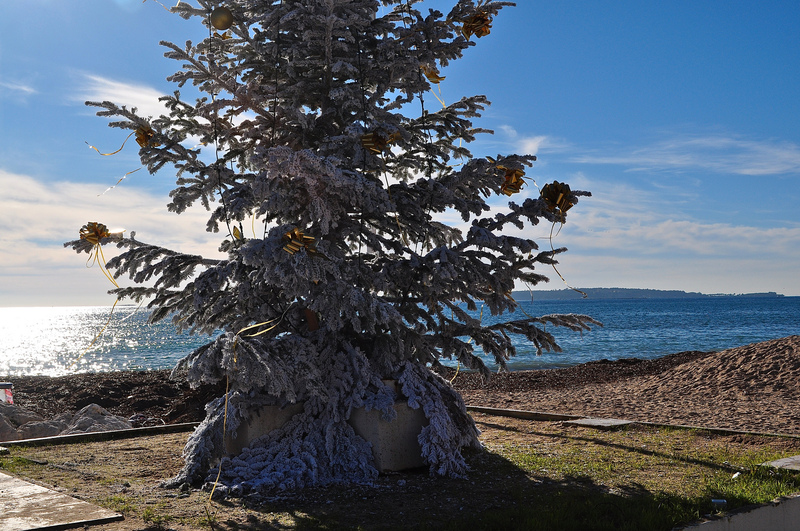 We love the juxtaposition of a winter Christmas fir tree with artificial snow seen against the sparkling blue tones of the Mediterranean here at Golfe-Juan on the Côte d’Azur. Who can possible resist? Next year, France will focus on this beach as it was at the quiet sleepy village of Golfe-Juan that Napoleon returned from Elba 200 years ago next February and plotted his return, setting in motion a series of events that, a few months later, lead to his ultimate defeat at Waterloo. 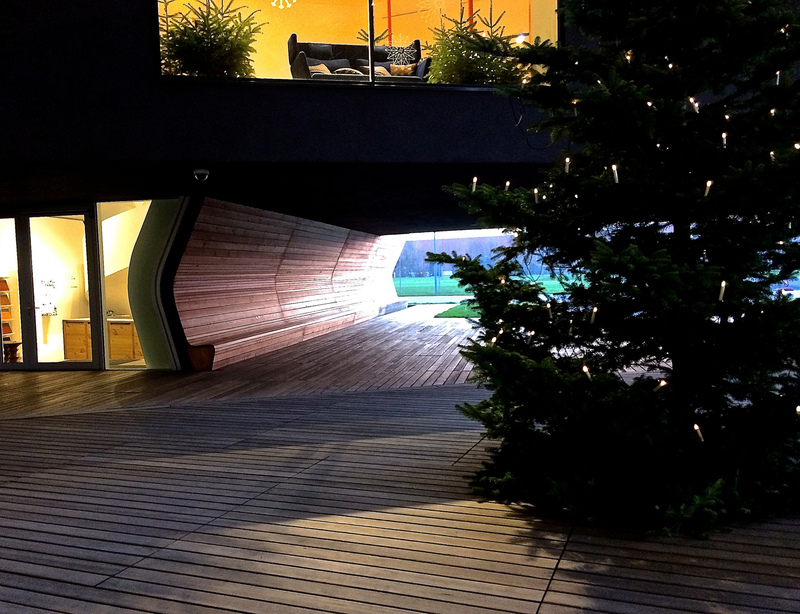 As huge fans of contemporary architecture, this traditional tree seems the perfect foil for this showroom for Vitra’s amazing factory at Weil am Rhein in Germany, just a short distance from Basel. Known for promoting the work of Charles Eames and other similarly talented furniture makers, every building on their compound has been built by a renowned architect – Frank Gehry, Nicholas Grimshaw, Zaha Hadid … and the VitraHaus by Herzog & de Meuron. Visitors can book a two hour architectural tour in a number of languages for just Euros 13 per adult. 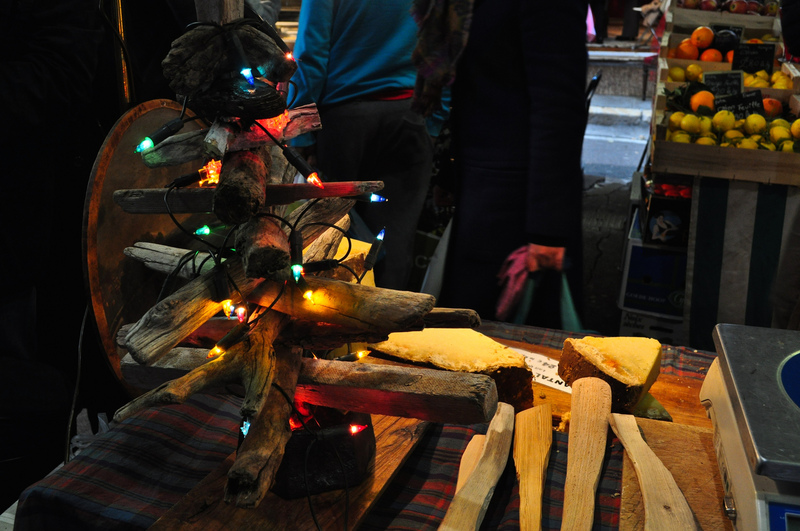 We spotted this driftwood Christmas tree in the marketplace in Antibes – simple, creative and effective – drawing the eye to their delicious cheeses on display. Antibes is of course home to the wonderful Picasso Museum at Juan-Les-Pins where he worked and played. It was here that he befriended a young, injured owl and took it under his wing (so to speak). The owl is a symbol that recurs regularly in Picasso’s work. We think Picasso would give this tree his approval! 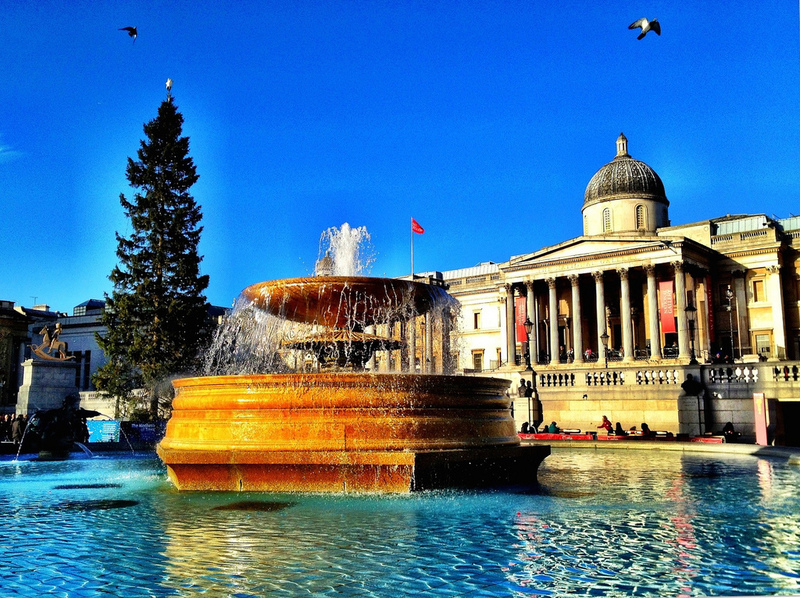 To finish of course, we have to mention the famous tree at Trafalgar Square in London, the symbolic centre of all festive activity in the UK which to us, marks the countdown to Christmas. Every year, the people of Oslo donate a fir tree to the people of Great Britain to give thanks for their help in liberating their nation during World War Two – a tradition that started in 1947. This picture is a couple of year’s old so see here for a film of this year’s Christmas tree, courtesy of The Daily Telegraph. Happy Christmas – Season’s Greetings – one and all.